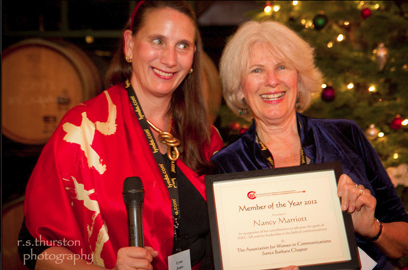 AWC-SB hosted their annual holiday party on Wednesday, December 5 at Carr Winery to celebrate the holiday spirit and honor Nancy Marriott as AWC-SB’s Member of the Year and Domestic Violence Solutions as Nonprofit of the Year. AWC-SB also recognized the staff, administration, volunteers, board, and residents of Domestic Violence Solutions as Nonprofit of the Year. Domestic Violence Solutions is a remarkable organization that works to better our community by supporting and assisting families in their recovery from domestic violence. This nonprofit is the only organization in Santa Barbara County devoted to aiding victims of domestic violence. Loretta Redd, PhD, Domestic Violence Solutions’ Interim Director and member of AWC-SB accepted the award for the nonprofit and shared a heart-wrenching tale about one of the organization’s most recent residents. Her story left the group full of emotion and gratitude for all that Domestic Violence Solutions does for our community. A photo slideshow of the party can be viewed at http://rsthurston.zenfolio.com/p171337587. Photos provided by r.s.thurston photography. This entry was posted in Past Events on January 24, 2013 by Lisa.